Hamilcar is a high-population, pre-rich water world with a billion or more sophonts in population size. It is a member of the Solomani Confederation in the Gemini Subsector of Solomani Rim Sector. This world has an alternate orthography of Hamilicar. Diameter: 2,300 miles (3,700 km). Gravity: 0.18g. Hamilcar is a high-population water world, part of the Near Boötes Cluster, and located within Gemini Subsector of the Solomani Rim. The system is a member of the Solomani Confederation. The high law level reflects primarily the taboo on violence; personal freedom is very little restricted. 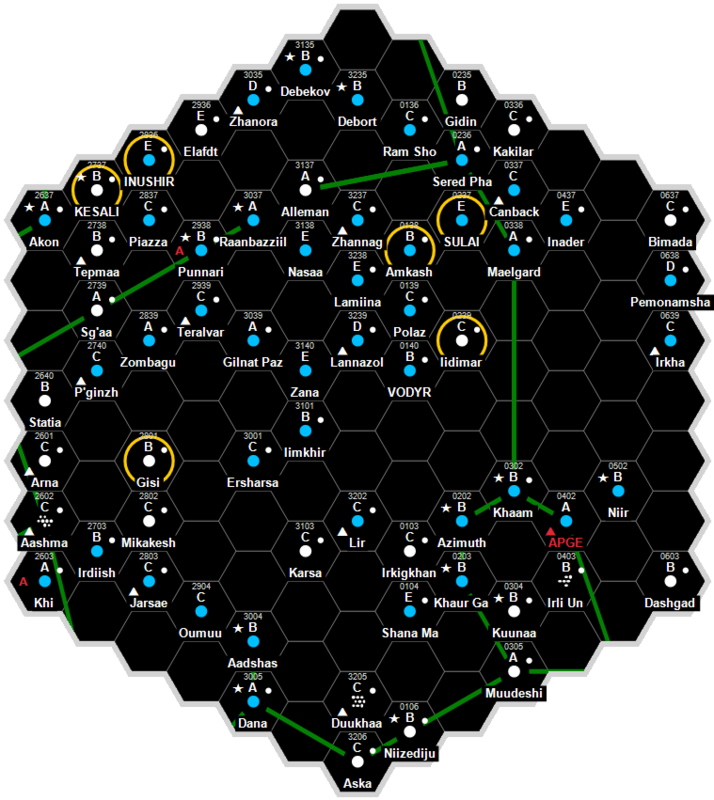 Hamilcar is the subsector capital and a major governmental center, containing the subsector headquarters of several Confederation ministries as well as SolSec. Hamilcar was settled early in the Rule of Man by a cultural group from Terran Polynesia. A few inhabitants dwell on small islands but most live in underwater domes or mobile semi-submersible cities. Hamilcar's primitive oceans were seeded with Terran sea life, which are now dominant species. Terran dolphins were also transplanted here before they were made sentient. Now that sentient dolphins also exist, populations of both types are found on Hamilcar, coexisting with relative ease. Two million of the world's two billion inhabitants are sentient dolphins; their representatives enjoy associate status in the planetary government. Most of the humans live in ship-cities and consequently share some of the dolphin attitude toward ownership of property. In an astonishing political coup, the dolphins have put one of their own into power on Hamilcar. The dolphin, Keekiiteep, is widely acclaimed as a wise ruler, even on other worlds of the subsector. Of course, politics is not a typical dolphin interest, but getting sophonts to cooperate and live harmoniously is a worthy goal, even to a dolphin. The heritage of the easy-going Polynesian culture makes the human population more receptive to Keekiiteep's guidance. John Harshman. The Solomani Rim (Game Designers Workshop, 1982), . John Harshman, Marc Miller. Solomani (Game Designers Workshop, 1986), 1-48. Gary L. Thomas. "Solomani Rim Data." The Travellers' Digest 13 (1989): 31. Kevin Knight. Traveller Chronicle 10 (Sword of the Knight Publications, 1996), . Jon F. Zeigler. Rim of Fire (Steve Jackson Games, 2000), 1-144. Paul Drye, Loren Wiseman, Jon F. Zeigler. Interstellar Wars (Steve Jackson Games, 2006), . David L. Pulver. Solomani Rim (Mongoose Publishing, 2012), . This page was last modified on 8 June 2018, at 20:44.